It's a game that used to be a favorite pastime among Filipino children. However, the deluge of new sources of entertainment has caused new generations of children to abandon the game. Ask a kid on the street if he knows what shatong is and he'll likely stare at you with a blank face. It's a game that's heading for extinction. So it's very encouraging to learn that there's a small foundation in Cebu that makes it one if its missions to bring awareness back to traditional children's games like shatong. 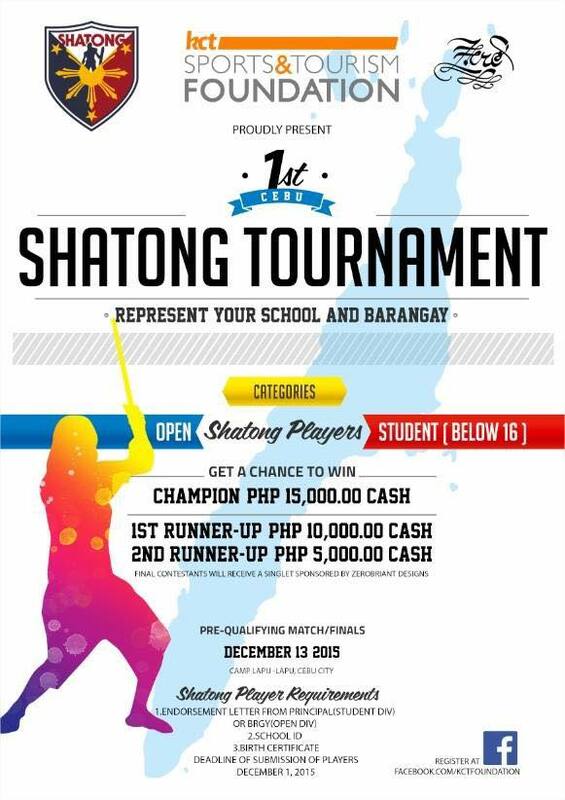 And this coming December, the foundation will be staging the first ever Shatong Tournament in the country. The KCT Sports and Tourism Foundation has announced that it will be holding the pre-qualifying matches on December 13, 2015 at Camp Lapu-Lapu in Cebu City. There are two divisions in the tournament - the open division and the student division (for students below 16 years of age). The prices will be as follows - champion: 15,000 cash, 1st runner up: 10,000 cash, 2nd runner up: 5,000 cash. For more information about the tournament like player requirements, visit the foundation's official Facebook page here.